Chips. Salsa. Guacamole. Three simple things that tell me all I need to know about the meal I’m about to have in a Mexican restaurant. If the salsa arrives and looks and tastes like ketchup, my hopes are dashed and I steel myself for the impending disaster that is surely to follow. But when the salsa is that perfect blend of fresh, spicy, tart and salty, my tastebuds jump up and do a little dance! And the candle on the cake is when they make guacamole tableside in a molcajete! Ah, guacamole. For me, it is the quintessential dip. I can eat it by the bowlful and god forbid I should run out of those amazingly light, salty tortilla chips! Why, yes, I would like more chips, please! I am a salsa and guacamole fiend! It’s no wonder I end up taking most of my main dish home in a to-go box! Three chips, folks. I mean, really. So let’s talk about this awesome molcajete I found! 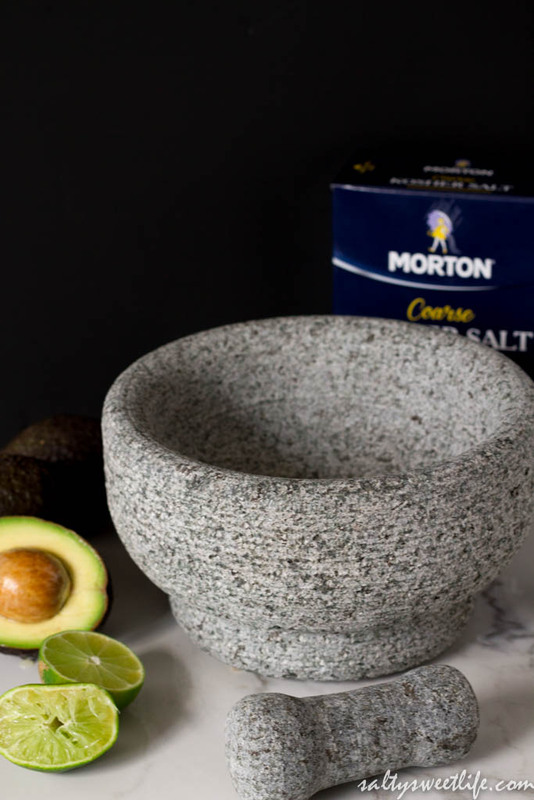 I almost hesitate to call it a true molcajete because it doesn’t have the characteristic three-footed base, so I’ll consider it a Modern Molcajete. How’s that for coinage? 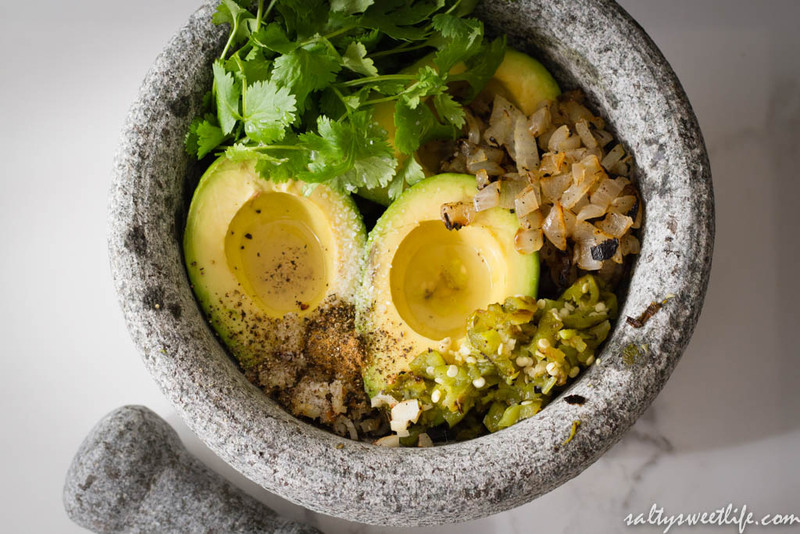 A traditional molcajete is basically a Mexican version of a mortar and pestle. I found this one at Costco recently for about $15.00 which is a steal! I have a much smaller mortar and pestle that easily set me back twice that price. At 8.5 inches in diameter and made of solid granite, it is almost the heaviest tool in my kitchen! 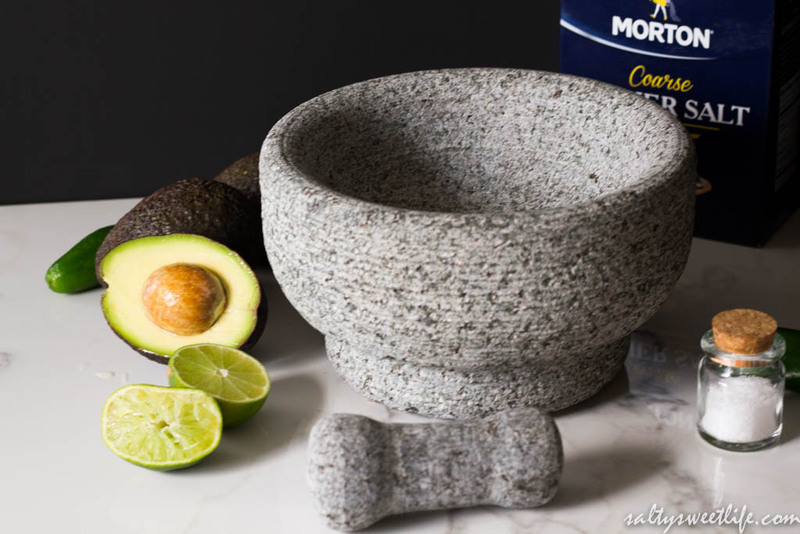 I’d been seeing this molcajete at Costco for quite a few weeks and I hesitated buying it because, as I mentioned, I already had a mortar and pestle and I have a bit of an aversion to duplicating kitchen tools. But my smaller mortar and pestle made it challenging to make pesto because it was just too small and the basil kept flying out of it! So with the great price and at double the size, I just couldn’t pass it up! I’ll still use the smaller mortar and pestle as it is perfect for grinding whole spices. 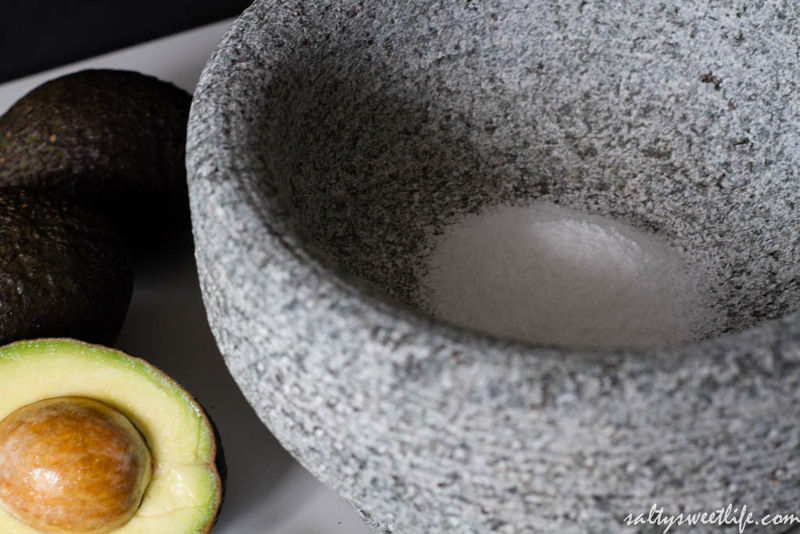 Any molcajete, traditional or modern, will require seasoning before it’s used the first time. This can easily be done by grinding rice or coarse salt until no flecks of stone remain in the grounds. I used coarse salt and ground it until it was a fine powder, then cleaned it out, and repeated the process with more salt. After that, a good rinse with clean water removed any remaining dust. As with cast iron or unglazed stoneware, you never want to use any soap when cleaning it–just plain water and a stiff brush. 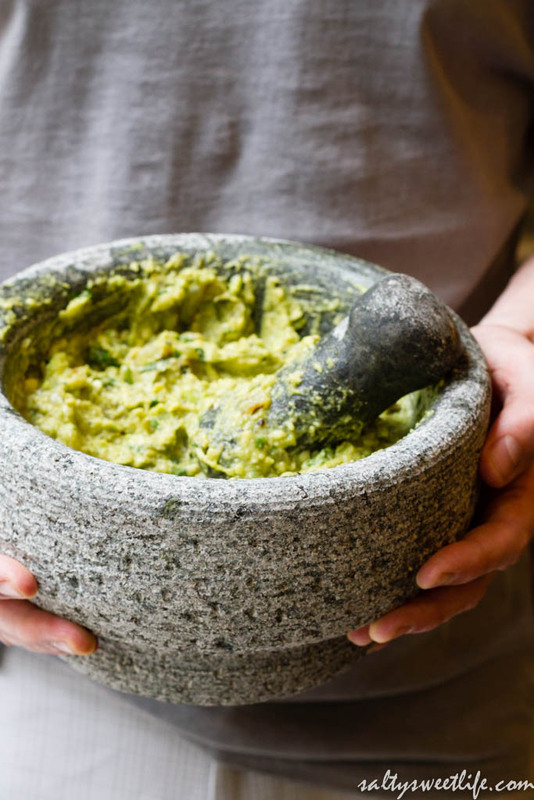 In same way that a pesto made in a mortar and pestle has a fuller, richer flavor than when made in a food processor, guacamole made in a molcajete is its bolder south-of-the-border cousin! Because I’m not your abuela, I’m sure I didn’t go about this in a traditional fashion–for one thing, I just piled everything in the mortar at the same time instead of systematically grinding the ingredients in steps. You’ll also notice the absence of tomatoes. I hope you don’t beat me up too much for taking such license, but I know that once you taste it, you will forgive me! This guacamole begins with onion, garlic and jalapeño peppers, roasted on the grill until the onion is lightly charred and sweet, the garlic, tender and the peppers, tempered and smoky. 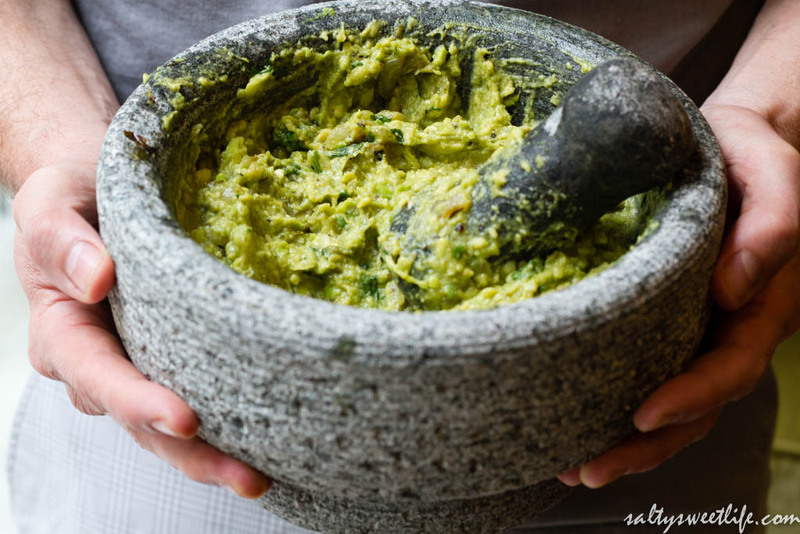 This is the magic–the key step that makes this guacamole special and gives it that smokiness. Then those ingredients are added to ripe avocados, a generous squeeze of fresh lime and cilantro and pounded until they meld into this most fabulous amalgam. Sweet. Smoke. Spice. Acid. 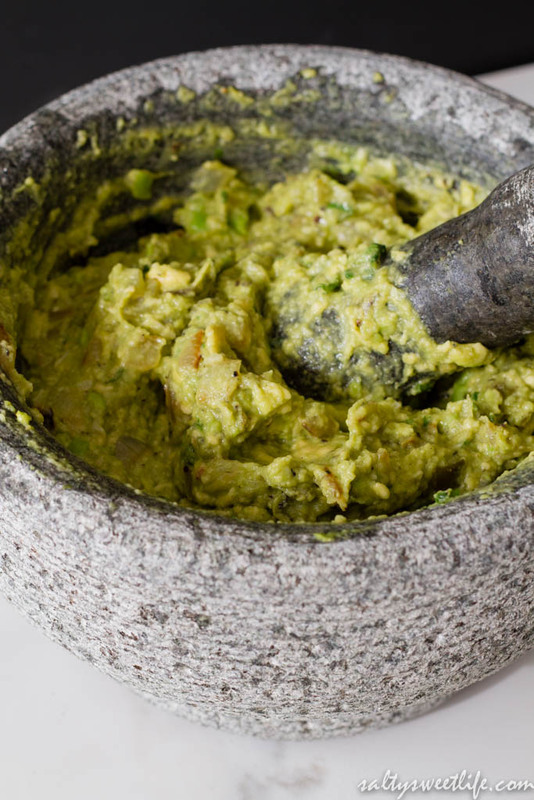 Seriously, this is the only guacamole recipe you’ll need. Slice 1/2 of a large onion into thick slices. 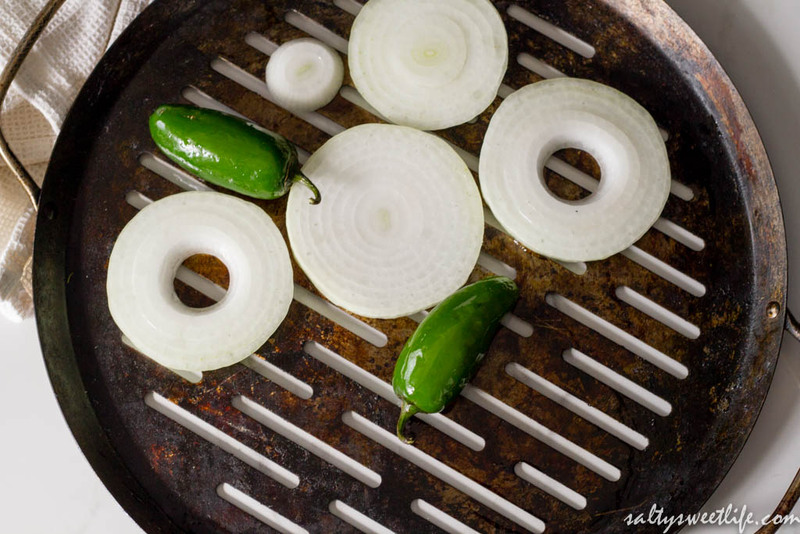 Coat the onion, jalapeños and garlic cloves with oil and place them on baking sheet or cast iron grill pan and grill until the onion is softened and lightly charred, about 10 minutes. With tongs, toss the onions often so that they don’t burn and rotate the jalapeños until their skin becomes evenly charred. Remove from the heat and allow to cool. When the jalapeños are cool enough to handle, the skin becomes wrinkled and easily peels away. Using gloves and a sharp knife, if needed, scrape the skin from the peppers and discard. Coarsely chop the peeled peppers. If you prefer more heat, leave the seeds intact. If you prefer a milder heat, scrape the seeds from the peppers before chopping them. Peel and mince the garlic, then chop the onion. 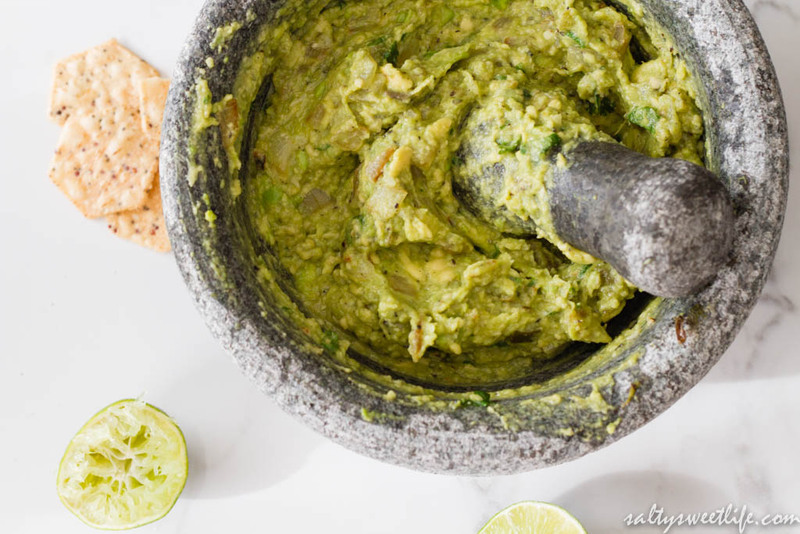 Place all of the ingredients into the mortar and using a pounding and grinding motion, mix until the guacamole is semi-smooth and all of the ingredients are evenly distributed. Taste and add additional lime juice or salt if needed. Alternatively, if not using a mortar and pestle or molcajete, mash all of the ingredients together with a fork or potato masher. Oh man Tracey!! This looks sooooo gooood!! Phew!! Thank you Nathalie! Word to the wise, this guacamole gets even spicier overnight (if you can get it to last more than one day)! The roasted veggies give it such depth! Glad you enjoyed! I just finished making guacamole and fresh pico! I love that you roasted your onion and peppers! That would definitely give it a nice round flavor. I’m with you about the salsa that tastes like they dumped a can of diced tomatoes in a bowl. yuck! Thank you Julie! I just love fresh pico and guacamole! Perfect summer treats! Me too! I am not ready to kiss summer goodbye. You’ve made me realise how LAZY I’ve been with my guacamole lately – and how WORTH it it is to do it properly!! I’ve added this to my reading list & will totally be following your recipe. Gorgeous photos too… Y.U.M. Thank you so much Amber! I’m so happy you stopped by!